MSP’s (Managed Service Providers) and VAR’s (Value Added Resellers) can launch a profitable remote backup service with Vembu BDR Suite as it provides an easy and an instant way to restore critical data in the event of disasters and also offers the advantage of securely storing backup data & the flexibility of restoring them whenever needed. Hence, Vembu BDR Suite makes it easy for MSPs and IT Service Providers to offer one of the most comprehensive, robust, and cost effective data protection solutions for their customers. 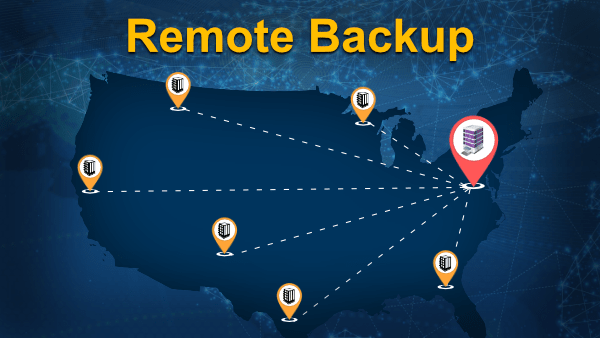 Vembu BDR Suite offers a cross-platform and high-performance backup software that helps service providers to offer a profitable remote backup solution. Single solution for all types of backups – Vembu BDR Suite can be your single solution for all your backup needs – be it backing up your Physical Machines, Virtual Machines, Databases, Applications or files. Backs up changed blocks alone – Vembu BDR Suite makes sure that only changed blocks of the modified files are backed up to the remote location during incremental backups. Continue where it left off – Vembu BDR Suite keeps track at the block level of data that has been already uploaded. In case of an interruption in the connectivity to the backup server, Vembu BDR Suite automatically resumes its backup exactly from where it left off, once the connectivity to the backup server is established. Efficient file tracking – Vembu BDR Suite uses Windows Directory Monitoring Service to keep track of the files that have been newly added or modified since the last backup. During the next incremental backup, it just reads these files and not the entire disk to identify what has to be backed up. Backup open files – Vembu BDR Suite uses Windows Volume Shadow Copy Service (VSS) to create a snapshot of files before backing up. Vembu BDR Suite can therefore even backup files that are open by other applications. Also using the VSS service, Vembu BDR Suite ensures that the files are in consistent state during backup. End-to-end encryption – Backup data is encrypted before leaving the source machine and stored in encrypted format in the remote server’s storage targets. So, the backup data is encrypted at-fly and at-rest. Automated multiple backup scheduling – Vembu BDR Suite supports weekly, daily, hourly and continuous automatic scheduling of backups. The backup jobs can be configured to run one after the other or multiple jobs can be scheduled to run at the same time. Backup Seeding for large backup sets – When the backup set is large and network bandwidth is limited, it could take days for the initial backup to complete. In such cases, backups can be made to run to a locally attached disk, the disk can then be shipped to the site where the backup server is located and the data can be imported from the disk into the backup server. Flexible retention policies – Vembu BDR Suite retention policies for the backup data can be configured based on the number of versions and based on the age of the version files. Separate retention policies can be set for deleting files and folders. Backup network and NAS drives – Vembu BDR Suite can backup files from any external drives – mapped network drives, NAS drives etc. As long as the user is able to access the files from any of these sources, Vembu BDR Suite will also be able to back them up. Central Management Console – Vembu BDR Suite provides a centralized console to manage backups, restores, replication jobs, license allocation, storage management, security policies etc. The console also provides detailed reports at all level. Multitenancy – Vembu BDR Suite is built for MSPs from ground up. It supports group management within the backup server. An MSP managing the backup server could create a separate account, allocate licenses, storage space, security credentials etc. for each customer. Customers can login and monitor the status of their backups. Automatic Software Update – Vembu BDR Suite can automatically push software updates added to the backup server into the different client machines running Vembu agent software. Integration with Third Party Management Solutions – Vembu BDR Suite integrates with management solutions like ConnectWise, WHMCS, and AutoTask for invoicing, event notifications, provisioning and monitoring.